Selene Parekh, M.D. (also known as the “Fantasy Doctor”) is an orthopaedic surgeon and foremost expert on sports injuries who’s fast becoming the go-to expert for the multibillion dollar fantasy sports industry. His data-driven insights and medical expertise make for powerfully accurate predictions of how anything from common sprains to devastating season-ending injuries will affect players’ careers and the success of millions of fantasy teams. Fantasy sports for Parekh is far more than a hobby: He authored and published two foundational research papers using Fantasy football data to track the epidemiology and outcomes of tendon and ligament ruptures in the NFL. Dr. Parekh joined the North Carolina Orthopaedic Clinic and Duke Orthopaedics in 2009, where he is a Professor of Orthopaedic Surgery. Prior to his tenure at Duke, Dr. Parekh was a Foot and Ankle Surgeon at the University of North Carolina (UNC). While there, he was integrally involved in the teaching of medical students and residents. Furthermore, he served as the foot and ankle consultant to the Athletic Department, treating many of the well-known UNC athletes. In his current practice, he continues to treat competitive athletes of all levels. 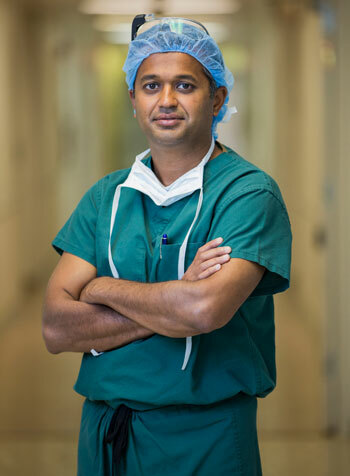 A graduate of the Boston University School of Medicine, Dr. Parekh completed his internship and residency at the Hospital of the University of Pennsylvania and his fellowship in foot and ankle surgery under the direction of some of the leading global authorities at the University of Pennsylvania. The Fantasy Doctor is an avid runner and has completed the Boston Marathon, and in his former life as a high school athletic star, was offered football scholarships from several Ivy League schools and was the recipient of the Brian Piccolo Award. Dr. Parekh is married and he and his wife are the proud parents of three kids. Click the headings below to learn more information.